Swedish Armed Forces, Centre for Defence Medicine attended the Medical Recruiting Brigade Dining Out. 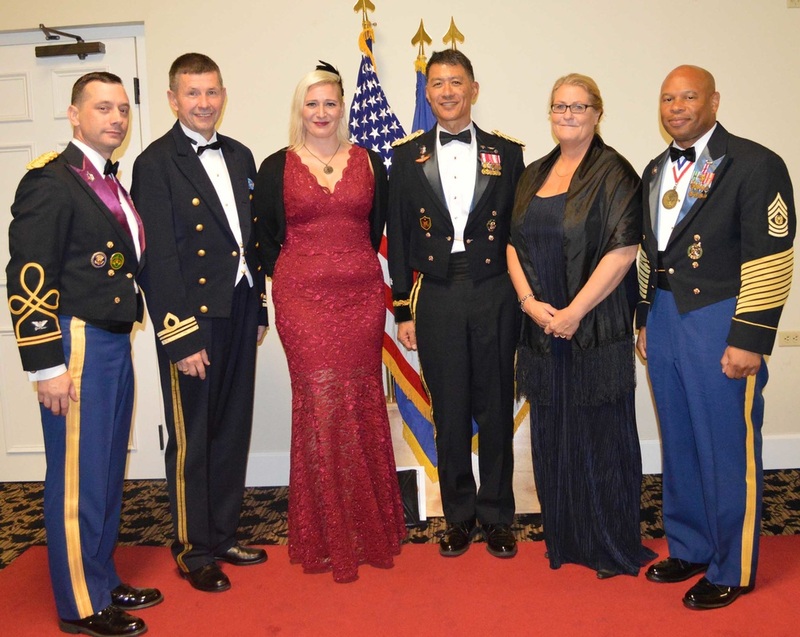 (Left to right) Col. Timothy Hudson, commander, Medical Recruiting Brigade; Maj. Lennart Hammarstrand, head of recruitment, Swedish Armed Forces, Centre for Defence Medicine; Adriana Dobrin, recruitment officer specializing in public relations and Information Technology; Maj. Gen. (Dr.) Joseph Carvalho, Jr.; Maria Westin, registered nurse and staffing officer for the Swedish Air Force and Cmd. Sgt. Maj. Vincent Lewis, command sergeant major, Medical Recruiting Brigade. Three Swedish medical recruiters visited Medical Recruiting Brigade headquarters on Fort Knox, Kentucky, in October to learn how the U.S. Army recruits healthcare professionals. Marine Maj. Lennart Hammarstrand, head of recruitment for the Swedish Armed Forces Centre for Defence Medicine, was on a mission to refine methods of medical recruiting. The Fort Knox visit was arranged by the Army’s Office of the Surgeon General. MRB Commander Col. Timothy Hudson provided an overview of the MRB organization, discussing the specifics of recruiting and explaining the challenges in finding healthcare providers. “We offer financial incentives, but it doesn’t always compete with what is available outside our system,” Hudson said. “We are asking older individuals, already established medical professionals to join the Army as healthcare providers. Swedish medical doctors are paid the same as civilian doctors, according to Hammarstrand. MRB S2 Chief Jackie Allen-Peters explained how research aids recruiters by providing them with demographics, locations of colleges from which the majority of medical students graduate, as well as research into practicing professionals. Hammarstrand said his office relies primarily on contacting people registered in a national database. Mission Support Battalion briefed the envoy on MRB assets to include the DRASH (Deployable Rapid Assembly Shelter) and the Medical Marketing Semi, which includes prosthetics and Army led research in the field of Traumatic Brain Injury. The Swedes also received a briefing from U.S. Army Recruiting Command’s Health Services Directorate on how the brigade handles reviewing, approving and selecting medical candidates and met with medical recruiters.